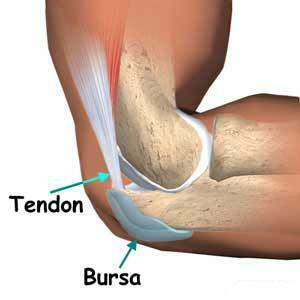 Bursitis is a condition that causes the bursae to become inflamed. This will often need to be treated by protecting the joint from further trauma and keeping the joint rested. Typically bursitis pain will fade after a few weeks if treatment is properly applied, but it is common for those that have suffered from this condition to see flare-ups again in the future. Bursitis symptoms may affect the shoulder, elbow, knee, hip or Achilles tendon, which are more common in those over the age of 40. In most cases bursitis is caused by constant repetitive motions or pl acing the joint in a position that continually irritates the area surrounding the joint. Gardening, carpet laying, painting, tile setting or playing a musical instrument are excellent hobbies and occupations of this risk. The chance of developing bursitis becomes increasingly more severe as you age. Those that suffer from conditions such as diabetes, rheumatoid arthritis or gout may have an increased risk of developing bursitis as well. During a bursitis flare up you can perform several home remedies that can help ease your discomfort. Bursitis in the heels is often caused by poorly fitting shoes. Replacing these with a shoe that fits properly can help to alleviate the discomfort. Seek out activities that appear to aggravate your bursitis and learn ways to reduce this discomfort. Investing in padding for your knees and elbows, resting in a more comfortable position or simply forgoing an activity may be helpful. After you have brought down the initial swelling, use a heating pack to increase circulation to remove any excess fluid. An ice pack applied in 20 minute intervals 3-4 times a day while elevating the joint can help to take down swelling. Ibuprofen is particularly helpful in taking down inflammation of the bursae while easing pain. Check with your doctor before taking this medication as it can interact with other prescriptions. If the inflammation in the bursa has been caused by an infection, antibiotics will be necessary to take down the swelling. As the pain decreases, focus on moving your joint though a full range of motion. Your doctor can provide you with a list of recommended movements depending on the affected joints. Avoid over-reaching and instead opt to use a ladder to help you reach high objects. Crawling your hands up the wall like a spider is an excellent exercise to assist shoulders affected by bursitis. Not all types of bursitis can be prevented but there are some things you can do to reduce the chance of a worse condition. Lose weight for if you are overweight this can put more pressure on your joints. Bend the knees while lifting instead of bending over. This will reduce the amount of pressure placed on the bursae of your hips. Instead of attempting to carry very heavy loads and putting pressure on the bursae of the shoulders, use a wheeled cart or dolly to move these items. When kneeling, place some type of padding beneath your knees to take the pressure off these joints. Before you will performing any strenuous activities, make a point of stretching to prevent injury.If you will be performing several repetitive tasks, rest or alternate other activities to avoid over straining the joints. Avoid sitting in one position for too long, particularly if you are sitting on a hard surface that will put a great deal of pressure on the buttocks or the bursae in the hips.Exercising regularly can build up the muscles to protect joints affected by bursitis. Most treatment of bursitis focuses on preventative measures, but if these options are not effective then medical intervention may be necessary. Corticosteroids can be injected into the bursa to relieve any inflammation that is causing discomfort. This is often known for providing quick pain relief, and in most cases more than one injection is not necessary. Physical therapy or specific exercises can be used to strengthen the surrounding muscles. This can help to reduce current discomfort and prevent this swelling from reoccurring. Your doctor will provide you with a list of recommended exercises for this task. In rare cases swollen bursa may need to be removed to reduce the symptoms of this condition. They can also be surgically drained to take down swelling.